AMSTERDAM, The Netherlands, August 9, 2013 (ENS) – Endangered chimpanzees, other primates and forest elephants could lose stretches of their habitat in Cameroon if a U.S. company’s plan to establish a palm oil plantation goes ahead. Based in New York City, Herakles Farms, known as SG Sustainable Oils in Cameroon, has claimed that its palm oil project in Cameroon’s Southwest Region would convert an area of little conservation value. But a new study by Dschang University in Cameroon, conducted in collaboration with Germany’s University of Göttingen and supported by Greenpeace International, SAVE Wildlife Conservation Fund of Germany and WWF Germany, indicates that this claim misrepresents the project area. The Herakles Farms plantation concession is bordered by four protected areas, including Korup National Park, and acts as an important corridor for wild animals. The forested area is located on Cameroon’s western border with Nigeria, within the Guinean forests of West Africa, an area known as a biodiversity hotspot. 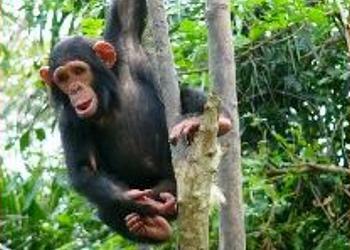 The study found the concession area to be inhabited not only chimpanzees, but also forest elephants, rare primates such as the Endangered drill and the Critically Endangered Preuss’s red colobus monkey, plus a number of fish species, many native to the region and found nowhere else on Earth. In total, 23 large mammal species were recorded in one block of the concession. 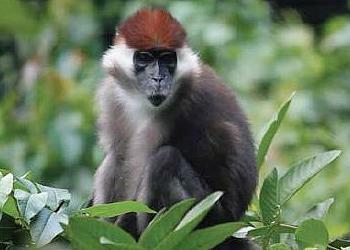 The block contains all primate and duiker species which are also listed for the adjacent Korup National Park, with one exception. The mammals or signs of them found in this block include: Elliot’s chimpanzee, Pan troglodytes ellioti, the drill, Mandrillus leucophaeus, Preuss’ Red Colobus, Procolobus preussi, and red-capped Mangabey, Cercopithecus torquatus. All typical lowland guenons, which are primates of the genus Cercopithecus, were found in the concession block surveyed, the report shows. Elephant trails and dung were recorded from four transects. All four species of duiker known from the region were recorded as well. The forest buffalo was not recorded, Dr. Waltert reports. The Nigeria-Cameroon chimpanzee is listed by the International Union for the Conservation of Nature as Endangered. Scientists estimate as few as 3,500 survive in the wild. Elliot’s chimpanzee has suffered high rates of decline due to habitat loss and is recognized as the most threatened and least distributed of all the chimpanzee subspecies. Recent field research by Greenpeace in the plantation concession area also found evidence of chimpanzee nests. The drill is one of Africa’s most endangered primates and 80 percent of the world’s remaining drill habitat is in a relatively small forested part of Cameroon. Fishes occurring in the plantation concession area are of high conservation value, reports Dr. Waltert. “In addition, the survey revealed the presence of a fish species probably new to science, the cyprinid Brycinus sp. aff. intermedius, so far only known from the concession area,” wrote Dr. Walter. 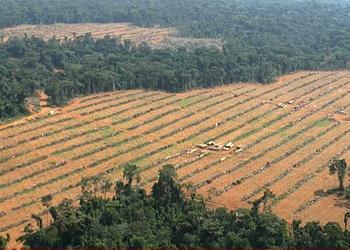 Herakles Farms suspended work on the Cameroon plantation project in mid-May in response to an order it received from the government of Cameroon’s Ministry of Forestry and Wildlife, MINFOF. The order comes at a time when the company’s main activity is the transfer of young trees from the nurseries to their permanent places in the field near the village of Talangaye. The company has had to lay off or furlough most of its 690 employees in Cameroon as a result of the MINFOF order. The Herakles Farms project has been plagued with controversy since it was first announced in 2009. “The project has also been developed without the adequate consultation or free prior and informed consent of residents, many of whom oppose the project and risk the loss of their customary land and livelihoods,” the environmental groups warn. Chief Atem-Ebako was speaking during the maiden annual general assembly of the association formed to ensure the smooth implementation of the memorandum of understanding signed between the company and the villages where the project is taking place. 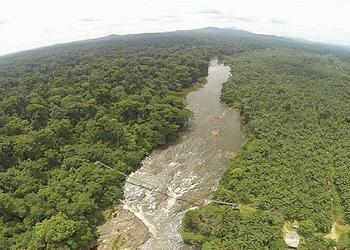 Nevertheless, some Cameroonian and international groups are calling for cancellation of the project.